We are getting ready for Valentine’s Day! We are excited to host the first in a series of visiting artists this Saturday, January 24th. 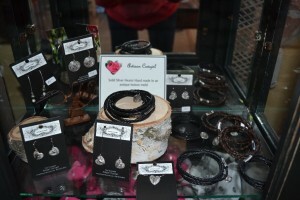 Pati Schaefer from Artisan Cowgirl will have a collection of handmade silver hearts as necklaces, earrings and bracelets! The pieces range in price from $19 – $88, many paired with pearls, and gemstones including garnets, pink tourmaline and pink sapphires. Each piece comes in a special “Pink Geranium” Artisan Cowgirl bag. Long time Barrington resident Pati Schaefer first learned her love of working with silver at Barrington High school. Working with new techniques, Pati creates unique silver pieces, many in antique button molds. Designs can be simple, or paired up with gemstones Pati sources from international business trips. You may recognize Pati and her work as she is an exhibiting artist at Art in the Barn each fall. We will also have available the necessary items for a romantic evening…Wine glasses, a selection of candlesticks, bud vases, and Valentine cards.